I absolutely love walking around any city I visit and trying to guess the dates of the buildings I encounter (can’t fight the art historian in me!). The revival of past styles was the hallmark of 19th century architecture in the West. But when have styles not been based on past styles in the West? Ancient Rome emulated Ancient Greece; Medieval, Renaissance, Baroque, 18th century, and 19th century architecture harked back to both ancient Greece and Rome; and postmodern architecture harked back to 19th century architecture. Stop the madness! 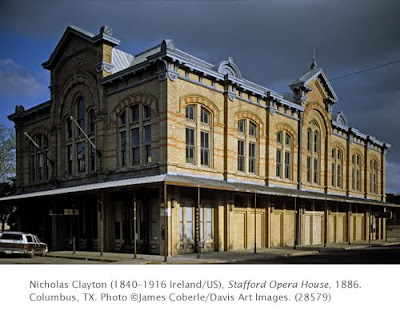 Although Texas was its own country (1836–1846), it clung to the American fascination with European styles. Obviously, it was because the people who immigrated to Texas were from all the major European migrant groups who had populated the East Coast. Interestingly, many of the Mexican-Americans who are natives of Texas pre-date American immigration into the state. (Immigration was opened to Americans in 1821. By 1836, there were 38,000 settlers). The Stafford bank and opera house was named after its founder Robert Stafford. In its illustrious history it hosted such renowned entertainers as Lillian Russell and Houdini. Clayton designed it in the then-fashionable Italianate style, a rectangular interpretation of Italian Renaissance villas. Key details of the style are pronounced moldings, string course, prominent façade bays with triangular pediment, and running first floor porch/overhang. This type of Italianate façade appeared on commercial buildings in almost every American city.